Terming the insistence on a debate on Foreign Direct Investment in retail without voting as "unreasonable", Bharatiya Janata Party leader Arun Jaitley on Tuesday said the government was not interested in allowing the Parliament to function. "The argument of the government that there must be a debate without a vote...absolutely has no basis," Leader of Opposition in Rajya Sabha Arun Jaitley said. He said, "There are voting provisions in the regulations for the conduct of both houses of the Parliament -- and therefore those regulations are not futile. They were not enacted without a purpose -- the whole essence of the democracy is voting -- the will of the people -- the will of sovereign"
The BJP leader said that for the government to contend that the issue must be talked about but never voted upon is "without any basis". "Voting and democracy co-exist -- they are not alien to each other. By raising such an unreasonable and unacceptable argument, the government is showing its intentions that it does not want the session of Parliament to continue," he said. 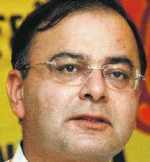 "I think the government is not interested in allowing the session to continue," Jaitley told the media at a function to pay tributes to former minister Girdhari Lal Dogra on his 25th death anniversary here. Replying to the question of hanging of Afzal Guru, he said, "Well, the law must take its own course -- after all the sentence has been upheld by the Supreme Court."